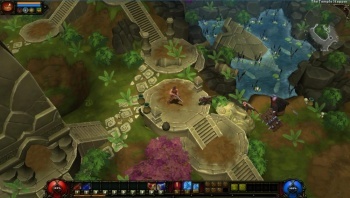 Torchlight 2 developers Runic Games say that a version of the game for current or next-gen consoles is unlikely. Torchlight best known as "that Diablo II clone" when it was released in 2009, quickly became a smash hit when people realized that it was a better Diablo than Diablo. An Xbox 360 version followed in 2011, and a PS3 version was planned, but later scrapped. So, when its sequel, Torchlight 2 came around in 2012, people naturally assumed we'd see an Xbox version at least. But it never came, and it probably never will, as Runic games have told VG24/7 that it has "no plans" for a release on current or next-gen consoles. While Runic stresses that the game has been hugely successful, you can't help but wonder what the release of Diablo III around the same time as Torchlight 2 did to its sales forecasts. Additionally, Blizzard have just released an Xbox 360 and PS3 version of Diablo III, with a next-gen version to follow sometime next year. The developer is apparently still planning to release a Mac version of Torchlight 2, but has run into some "unexpected complexities," and is quite busy trying to "scramble to ramp up on [its] next project and get it moving forward," that it cannot offer a release window at this time. Runic announced that back in June that Torchlight 2 had sold over 2 million copies since its PC release. With Diablo III's expansion pack right around the corner, and considering Diablo III monstrous sales success, its probably best for Runic to focus on a new project, rather than continue to support Torchlight 2.